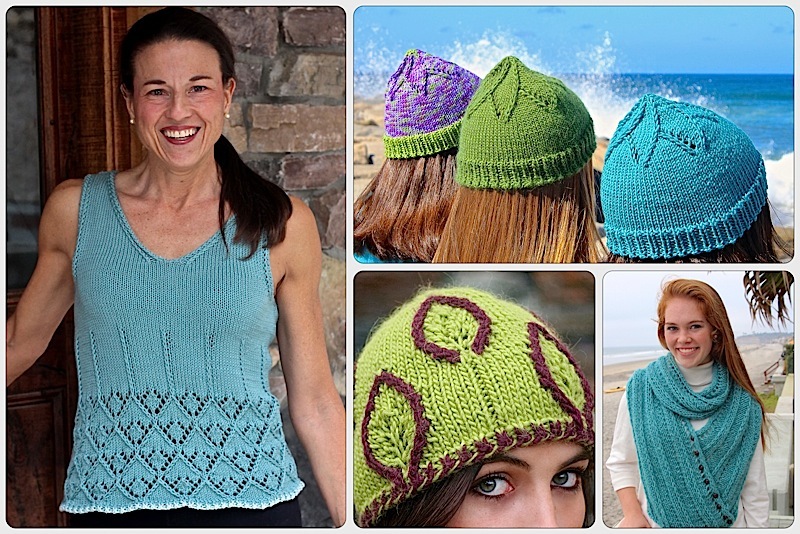 Knitting Nuances | A 2015 – 2018 Top 100 Knitting Blog! A 2015 – 2018 Top 100 Knitting Blog! Join Us! Follow the Blog. This double increase results in a well supported open eyelet that stands out in your work. Shown here in a swatch with decorative edges that can be used as a template for a triangle shawl. Looking for a pretty and flexible bind off? The Knotted K2Tog Bind Off combines two bind off methods with dramatic results. Wait. Don’t Knit 1 F&B, Look What Happens When You Reverse It. This simple change results in a less noticeable increase. There was a wonderful response to our request for test knitters for a new sock toe. The take away you can use in your knitting now. Also a sneak peek to a new chevron concept. Who Wants to Test Knit a Sock Toe? It’s time to start applying our Nuance techniques to socks. In this introduction post we are asking for about 50 test knitters to try them out. These boot toppers are fun coming and going with a sassy seam up the back. They are based on Irish dance socks and feature the Showy Cable. What Makes a Knitter a Knitter? There is a difference between knowing how to knit and becoming a knitter. What is that difference and how can you become a knitter for life? Includes a free Knitting Skills Checklist you can download. Blog posts are mostly saved for new project and skill announcements. If you’d like to get sneak peeks and quick updates then follow KnittingNuances on Instagram or Facebook. These seamless top down mittens include a lot of details that help them fit beautifully. These include: Judy’s Magic Cat On, shaped fingers to reduce bulk, curved palms and an easy after thought thumb. The design uses a new faux cable rib technique. These clever Christmas stockings look like a brick fireplace! The pattern includes a decorative cast on and bind off, two heel options (German Short Row or Afterthought) and raised Showy lines. Garden Shawl a Vogue Knitting Finalist! Knitting Nuance shawl selected as top 10 finalist in Vogue Knitting’s worldwide mohair design contest. This pattern takes the Showy Garter stitch used in the Smart-Baby Blanket to the next level with broken vertical lines that look like bricks. The geometric design is perfect for everyone in your family. The lines in this Smart-Baby blanket are based on the Fibonacci sequence so beloved by nature. This poncho uses the recently announced Porthole Eyelet and Showy vertical lines to create a clean but deeply textured stitch pattern. The design also includes a decorative cast on and bind off that are both practical (they bend) and pretty. Ever wanted to go on a knitting retreat? This was my first time and it was so much more than I thought. Read about the resurgence of American wool, sustainable ranching and, of course, the fabulous classes.